Are You Watching the Starz Show 'POWER'? I need to know if anyone is watching the show POWER on Starz. I've watched a few episodes and God knows I've tried to like this show, but I'm just not feeling it. Don't get me wrong, I love watching Omari Hardwick naked just like the next woman, but that hasn't proven enough for me. I don't even mind the extramarital affair Omari's character is having with his high school sweetheart. The tired storyline of a drug dealer trying to go legit doesn't seem to bother me as much either. 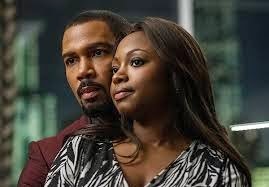 The thing that seems to bother me the most is Naturi Naughton's character, Tasha. I just can't with Tasha. For me, Tasha has no redeeming qualities. There is nothing about this character that makes you want to root for her. You can completely understand why her husband would cheat on her because honestly outside of her being a "ride or die" chick you can't even understand why he married her. Instead of coming across as the wife, she comes across as the side piece or shall I say THOT. As a comparison you can look at how Shonda Rhimes writes Mellie on Scandal. Mellie is a damaged and flawed individual, but yet you still find yourself rooting for her happiness even while you are hoping for Olivia and Fitz to be together. Mellie is her own person, who loves her husband in her own way, but would be damned if she stepped outside her role as the wife. Olivia is the side piece and Mellie will never let her forget that. In the hierarchy of complicated relationships, the wife is always supposed to rank higher than the side piece. A character like Mellie gets that while it seems Tasha would be more comfortable being the side piece than the wife. Mellie has dignity; whereas, I feel Tasha has none. Maybe I'm over analyzing the show (after all I still have it on my DVR), I just wish they would do something with the Tasha character. Naturi Naughton is a wonderfully talented actress and I think she deserves better than this one dimensional character she's been given. Are you watching the show? If so, please tell me what you think?